SweetSweet® is an odor control product meant exclusively for use in sewer manholes. The unique design of SweetStreet® allows it to fit within the manhole itself. Once the manhole cover is replaced, SweetStreet® is completely out of sight. SweetStreet® is a two-part assembly. The manhole insert fits down within the manhole. 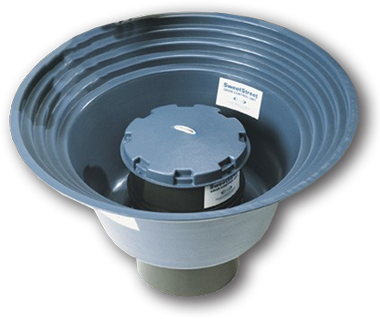 SweetStreet® uses a stepped design that allows the housing to be cut to fit the exact size of the manhole. The carbon module holds 20 pounds of CENTAUR® HSV catalytic activated carbon. SweetStreet uses the positive pressure generated inside the sewer line to push the contaminated air up through the unit. The odorous compounds are absorbed by the CENTAUR HSV carbon, allowing clean air to vent through the top of the SweetStreet and the manhole cover into the atmosphere. The pressure surges within the sewer are sufficient to overcome the pressure drop across the carbon bed. When odor breakthrough occurs, only the carbon needs to be replaced. Refill bags of CENTAUR® HSV carbon are available from Continental Carbon Group.